Hi friends, we're almost through the week, YAY! I think sharing a recipe today will help set us up for our discussion later this week on the third common barrier to adopting a real food way of life. If you haven't already, check out my first two posts in the "barriers to real food" series. Today I am going to share my favorite quick, healthy, real food recipe that is my go-to breakfast during the busy week! First, I need to give credit to my favorite real food RD. About two years ago a friend told me I should check out Dietitian Cassie. The information on her website and her "real food" approach to nutrition really inspired me. I was thrilled to see that there were credentialed registered dietitians that didn't subscribe to the conventional nutrition practices and guidelines that were fed down our throats as dietetic students. She had a recipe for her Egg Bake which I thought sounded like a great idea. I tried it one week and was hooked. I continued making an egg bake for myself weekly, and even cooked them for my boyfriend and my dad whenever I was home. After many weeks of making the same recipe I began to make my own adjustments and variations. The recipe I am sharing with you today is what my egg bake creation has transformed into over the last 2 years. The best thing about this recipe is there are endless variations. It is also a key part of my Sunday meal prep. This is a great "cook once, enjoy 4/5/6 times" recipe! I love getting sausage from the meat market. They make it fresh in-house without any additives or sugar. Try to stick with fresh sausage in the meat department of your supermarket or get it from a local farm or meat market. Some places, such as Whole Foods, make their own sausage in-house, so ask an employee what they have available. Uncured (nitrate free) bacon can be used instead! Ingredients from a common packaged sausage sold in the refrigerator section of your grocery store. run far, far away from this. This is not real food! If you don't feel comfortable handling the raw meat your next best option is a precooked chicken sausage from Aidells or Applegate Farms. These brands, and others, such as Trader Joe's or al fresco's chicken sausage, are uncured and most varieties do not contain added sugar. Just keep in mind, these will not need to be cooked ahead of time, so you will miss out on some of the greasy goodness, but it will still be delicious! 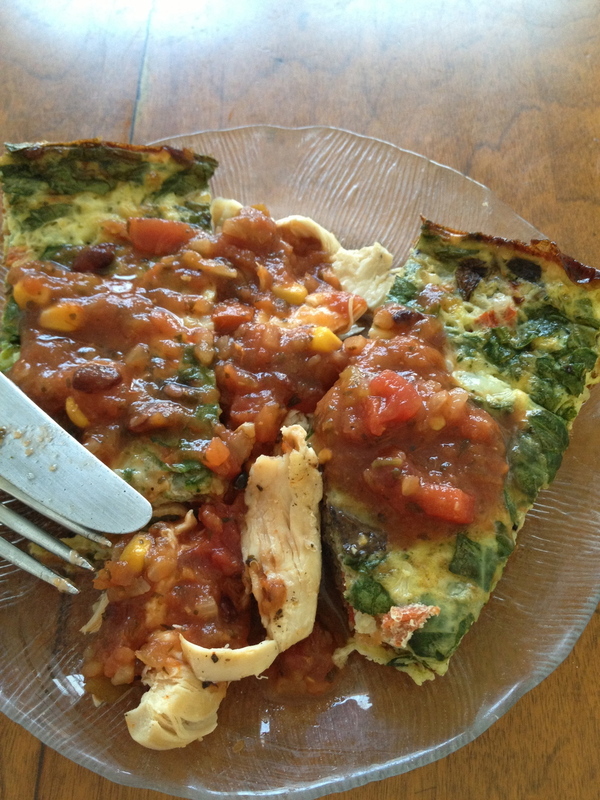 I love to add a second, frozen veggie, to my egg bake in addition to my spinach. It helps add to the texture and taste! It's also a great way to use up some frozen bags of veggies from the freezer. I like frozen broccoli florets but I've even used a frozen corn, carrot and green bean blend before, too! Fresh tomatoes, peppers and onions can also work great! If you'd like, you can substitute kale for your spinach as well. Switching up your meat and veggie pairing is the best way to make your egg bake your own and prevent boredom. 1. Gather supplies and ingredients. 2. Preheat oven to 375 degrees. Grease baking dish liberally with butter. We don't want it to stick! 3. If using frozen other veggies, place them in your small bowl and fill the bowl with water. Let them sit (they're defrosting) while you continue prepping. 4. If using fresh sausage in casing: Turn on the stove and warm up your skillet. Using your knife, slice lengthwise through the casing of each link. Peel the casing away and discard. Using your hands break the now bare sausage links into pieces and put them in the warmed skillet. If you are using bulk fresh sausage just break up the sausage with your hands, you will not have casing to remove. Use your spatula to move the pieces around and flip them over until your now crumbled sausage is cooked. It will be cooked when it is no longer pink. Since this sausage will be going into the oven you don't need to get too crazy here as it will finish cooking in the oven. Just make sure all sides of each crumble touch the hot pan. If you are using precooked sausage use your knife to cut the sausage into pieces. You do not need to warm them on the skillet first. Turn off the stove when the sausage is cooked/ browned. Here is how my sister cooks up her sausage for her weekly egg bake. She chooses to cook down her spinach with her sausage. Do whatever works best for you! 5. Now grab your big mixing bowl and crack your desired amount of eggs. Think two eggs per piece (a 9x13 pan will take 12 eggs and make six pieces). Use your whisk to beat the eggs. Here you can add in your big splash of optional heavy whipping cream. It will help the eggs get fluffy in the oven, but don't worry about it if you don't have any around. 6. Now whisk in your spinach. Feel free to tear it up with your hands before you throw it in. 7. Drain the water out of the bowl with your other veggies and whisk those in as well. Give your mixture a few shakes of salt and pepper. 8. Using your spatula, distribute your cooked sausage onto the bottom of the baking dish. This step helps create a bit more grease to prevent sticking, plus it helps the sausage be evenly distributed throughout. 9. Next, pour your egg and veggie mixture into the dish. 10. Put in the oven and bake for 40-45 minutes. You will know it's done because the edges will begin to brown and the middle will no longer look jiggly. Tah-dah! You know have an easy breakfast for everyday of the week! Enjoy warmed up with cheese or butter on top. Try it with guacamole, avocado or salsa! A side of fruit will round out this perfect breakfast. Check me out on Instagram (@f00dCOURT) to see all of my new egg bake combos! Below are some pictures of how I like to enjoy my egg bake! I keep it interesting by switching up what kind of meat I use each week. Here's a tip: if you are in a SERIOUS rush one morning egg bakes still taste great cold. Grab a piece of fruit, wrap a slice of egg bake in some foil and eat it just as you might eat a burrito or sandwich on-the-go. I hope this inspires you to eat breakfast. Eggs are the best! And this is a very inexpensive and time saving recipe to help you and your family start your day right!